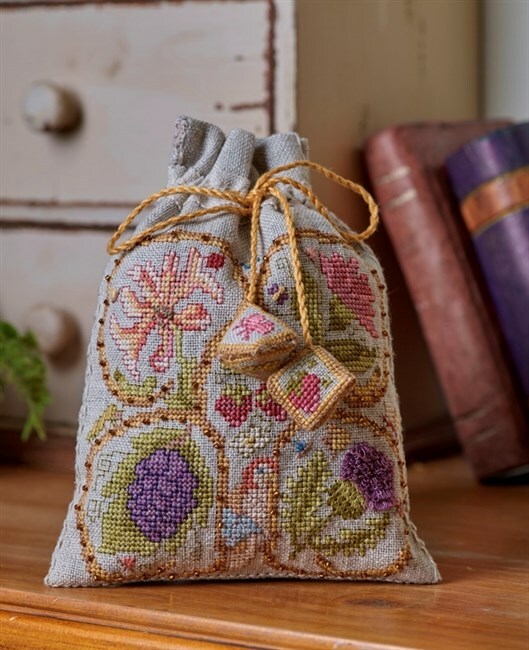 As the Cross Stitch Guild, we hold various stitching events around the UK. Fifty people joined us at the Hilton Hotel and either stitched a project of their own or took on my challenging Hearts and Flowers Needle Roll. The design could be worked as a little band sampler or lined in felt and made in to a little needle roll. At present, this project is only a class piece but I expect that Andrea will introduce this as a kit later in the year, possibly in time for The Knitting and Stitching Show at Alexandra Palace in October. I am sure that many of you are already familiar with the gorgeous Little Linen Book made for me by Kate Bowles but I found these images this morning and just had to share them with you. Joy Moran, a long time Cross Stitch Guild member has stitched and decorated many of these and I thought you would like to see some pictures. 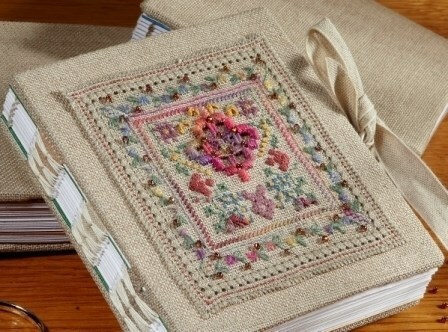 Kate’s books are hand made and you can see the decorative binding from the picture below. Do have a look at her Blogspot when you get a minute! The Little Linen Books are still available from www.thecrossstitchguild.com – We would love to see what you do with your copy! My portrait by Harriet Riddell drawn on her sewing machine freehand! Back from the show and in the office at home with some stitching on my lap. We have our first Together We Stitch Weekend in 10 days and I am designing and stitching the project which is certainly not quite ready. I have to complete it by tomorrow as Andrea needs time to make up the material packs – Some late night oil will need to be burnt tonight! I had such a lovely time at Olympia working for Andrea Thompson on the Cross Stitch Guild stand at the Knitting and Stitching Show – one of the best bits was watching Harriet Riddell drawing portraits of people who popped on to her stand. She drew this picture of me from life in about 40 minutes freehand on her sewing machine! I just love it…….Harriet Riddell is so talented and so nice about it! Do have a look at her web site and see what she has been doing. On tour in India, she stitched pictures of the Taj Mahal sitting in the grounds with her sewing machine! If you look at the picture, I was holding our Elizabethan Sweete Bag and she captured it perfectly and in seconds! The Cross Stitch Guild stand was heaving for most of the show and kept us all very busy either teaching or serving customers. This was the first time that I had attended this show without being the boss and it did feel strange at first. I soon got the hang of it…… Nothing to worry about and time to shop for myself! Dress patterns, a cardigan and, of course, my portrait! Monty and I have been enjoying the slightly warmer weather and apart from the mud (there is a lot of that!) we have, at last, seen signs of spring arriving here in the Cotswolds. Monty is a Cockerpoo and will be two this month and is absolutely crazy about water and in any form. Apart from keeping him away from the swans, I do not mind him splashing about although you need to maker a quick retreat when he comes out of the river! Look – I have a stick! We are very privileged to live in such a lovely part of the country although our village had two hundred new houses added in the last year! They are very attractive and well planned to fit in with the local stone but can we cope? Fortunately, The Ernest Cook Trust owns most of the remaining land and manages it very carefully preserving the look and feel of the country. I do not think a day passes when I am grateful……. These little pockets are very simple to make up as there is so little finishing to do…..Stitchers often do not like sewing! You can buy linen band from the CSG web site – the limit is simply your imagination!